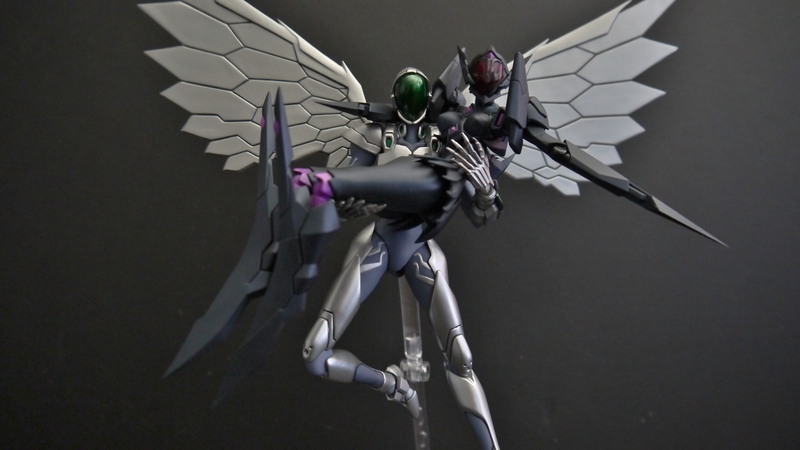 Accel World’s lead female protagonist/senpai was released in her Duel Avatar form alongside her partner, Silver Crow. 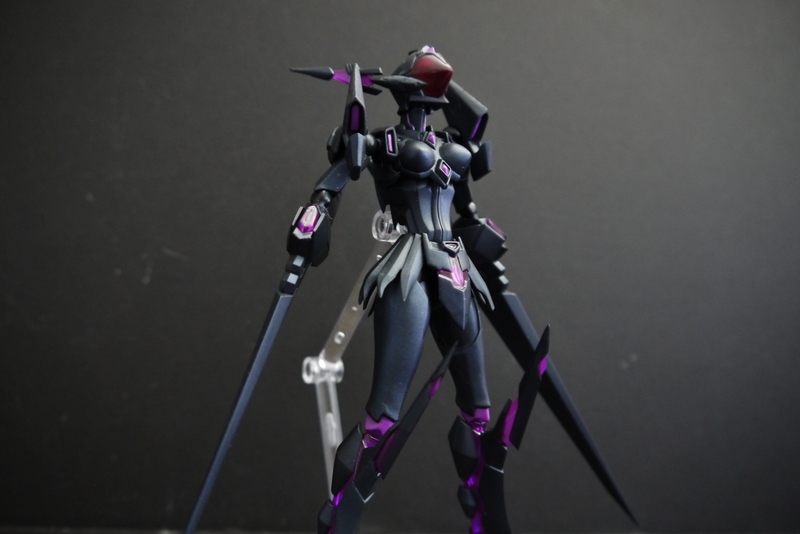 It was a breath of relief to see the gorgeous promo pictures of the Figma online; before this, Accel World fanboys had only the Figure-rise model kit to sate their Black Lotus desires. Out of the box, you get Lotus in her standby mode. Blades and everything are all retracted, and she generally looks pretty placid. 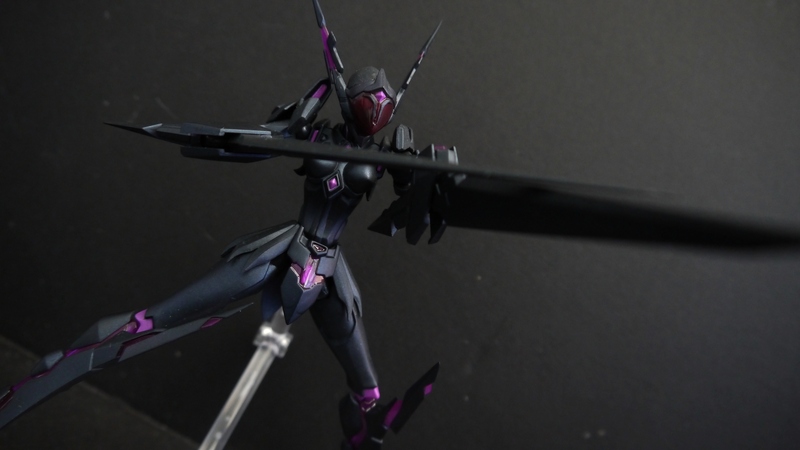 The figure itself is in scale with Figma Silver Crow, making her very tiny; palm-sized and rather skinny for a figurine. One of the most amazing parts of this figure is the black finish. The matte effect is spectacular and incredibly smooth. The anime actually depicts Black Lotus with more of a metallic black metal-esque finish, but as a personal fan of matte, I think it works really well. There isn’t much in the ways of an actual paint job, since the figure itself is flat black and you get some purple highlights here and there, that are overall done pretty well. 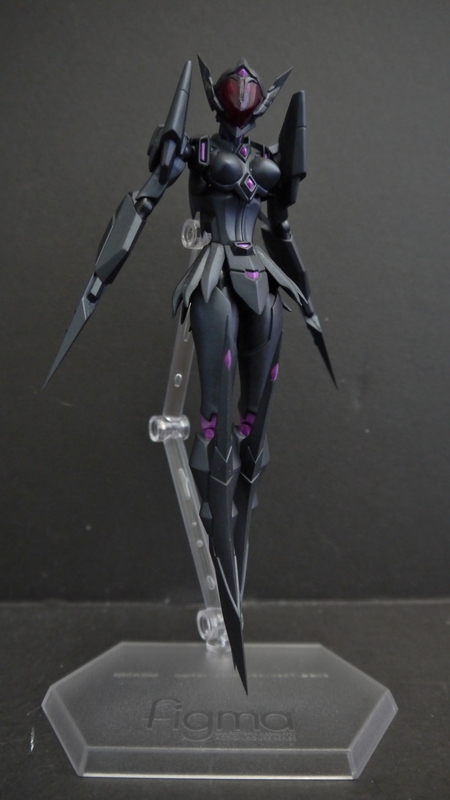 The only clear purple pieces you can see in Lotus’ standby mode are behind her legs and the face visor. The glossy purple paint apps versus some of the clear purple create a little inconsistency throughout the figure, though it isn’t really noticeable and pretty much completely neglectable by the end of the day. This is what the real Braku Rotus is about. Funny thing, given how small the Figma is, Max Factory couldn’t really pull off any significant opening gimmicks to actually have Lotus convert from standby to battle mode, so as a work-around extra costs were put in to giving us extra legs, arms, shoulders, etc. An extra figure is pretty much included in the package, given how much you get. To convert Lotus, you get an entirely different head, arms, shoulders, legs, front skirt, and back skirt. The only pieces used in both forms are the torso and thigh sections. Talk about extreme parts-swapping. Still, due to the part swapping nature of the figure, it retains excellent stability. The joints are satisfyingly tight, and there’s much more articulation in the arms and shoulders than I would’ve ever expected. The giant hand blades/cleavers are also extremely large and look pretty deadly. Needless to say, Lotus has a lot of pointy and fragile ends, her extended battle-mode ears being one of the most prominent. Gotta watch out when switching that stuff out for the standby head. Overall Max Factory does a good job by making some of the pointy, prone-to-breaking ends out of a soft PVC material, meaning they can squish a little under pressure without snapping. However, this figure obviously isn’t meant for small children; Max Factory don’t go out of their way to make this thing meet safety standards. Almost every point is razor-sharp, especially the giant cleaver blades. Given how massive and sharp they are, I could use them in the kitchen to cut tomatoes for supper. Believe it or not, it’s actually kinda hard coming up with poses for this figure…having watched the show and grown to know and love the character, its kind of unnatural putting it in funny poses just for the heck of it like I usually do. The clear head visor isn’t as transparent/opaque as I hoped it would be. The clear plastic is a very dark purple, and I’m almost certain the face underneath is colored flat black. That doesn’t usually make for the most outstanding use of a clear piece visor. It would’ve been cool for the underside to be silver, similar to Silver Crow, so the face would kinda shine, though it isn’t a big deal overall. If it catches the light at just the right angle, you can barely make out the eyes inside the visor. Lotus comes with the usual Figma stand, and it plugs right into her back like the rest. She can’t really operate without it since y’know…lack of feet. Unfortunately Max Factory was cheap and didn’t include a self-hovering ability for her. From what I’ve seen so far in Figma, they constantly impress me with how well they design some of their joints and hide them so discreetly. I used to dislike Figmas for their more or less blatant elbow and knee joints in almost every figure, but I’ve come to realize that that’s pretty much impossible to avoid unless Hot Toys developed it. Like Silver Crow, Link, and Samus, I’m most impressed again with Lotus’ ability to turn her torso despite the lack of a waist. The torso joint is again hidden in the chest, and the sculpt is flawless in allowing Lotus to turn side to side without looking unnatural. 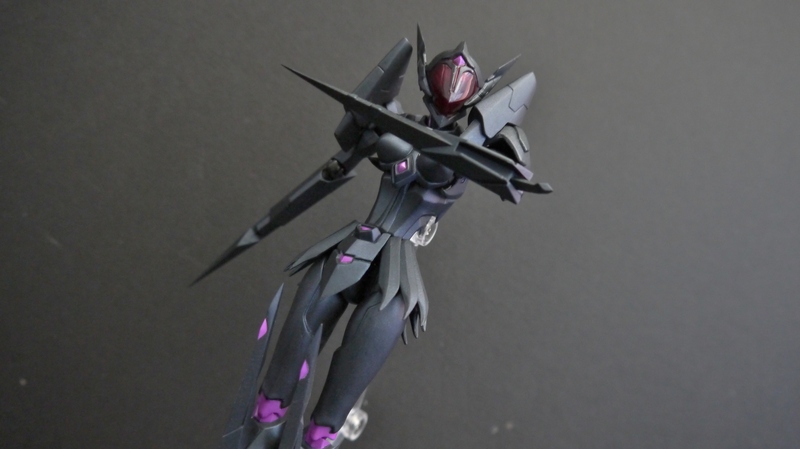 All in all I gotta say Black Lotus is another excellent addition to the Accel World Figma line-up. Scarlet Rain has just been released in addition to Silver Crow and Lotus herself, so we now have three Duel Avatars up for grabs. Although the Figma lacks any real effect parts and such, the figure itself is a great buy and looks absolutely gorgeous, especially compared to the sub-par Figure-rise model kit. Fully compatible with Figma Silver Crow as well. I like the romantic pose in the last photo. Her character design reminds me a little of the mechs from Zone of the Enders.